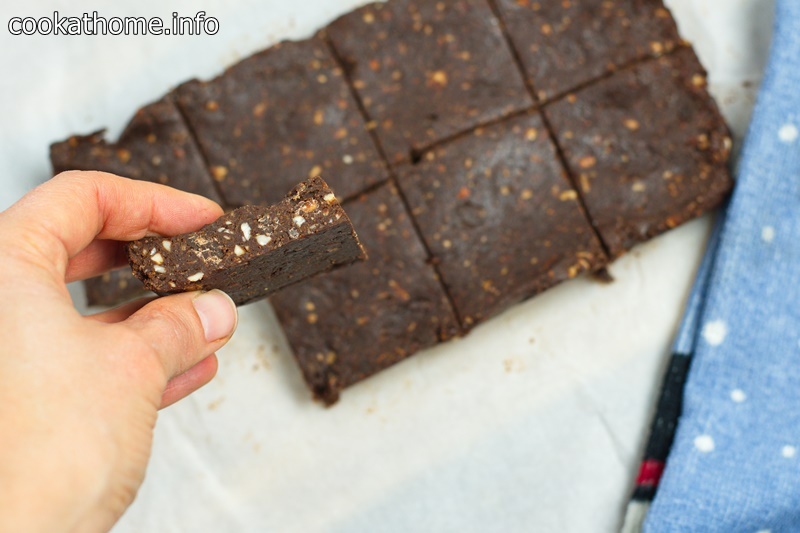 Chocolate prune bars with all healthy ingredients, using nuts and seeds for extra crunch and a rich chocolate taste. I have a friend (Samantha) who would always pay me out when I mentioned I had prunes with my yoghurt / oats / cereal for breakfast. I gotta say, though, that when you get them direct from the fruit & nut shops, and they’re nice, plump and juicy, they are definitely worth eating. And all the other health benefits also help! 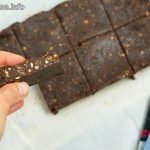 Be aware that this is a very thick bar and you need to have a very powerful food processor – I’ve blown up at least one motor in a food processor making this slice previously! Line a loaf tin with a piece of baking paper and set aside. In a food processor, add almonds and pulse until coarse bread crumbs have formed. Add the chocolate chips and linseed and pulse until finely chopped. Place this mixture in a bowl and set aside. Place prunes, honey, peanut butter and cocoa powder into the food processor and pulse until the mixture comes together. Add previous almond mixture into the food processor and pulse for a few seconds until everything comes together. Press the mixture evenly in the prepared pan and fold excess paper over the pars. Chill for at least 2 hours (I put it in the freezer and it was ready in 30 mins). Transfer the mixture to a cutting board and cut as desired. I keep my bars in individual zip-lock bags in the freezer.